I remember riding the Expo Line on my way back home from school for the first time two days after it opened in 2012. It was hard to imagine that that same train in four years time would reach the sea and harder to imagine that 60 years prior, the Los Angeles region had done that all the time. Many people underestimate the role public transportation plays in Los Angeles, thinking that the city was made for the car. The $1.5 billion Expo Line extension to Santa Monica opened Friday to move away from that thinking and finally show Los Angeles’ continued efforts to develop a better mass transportation system and commuters’ growing urge to take advantage of one. People can now travel from downtown Los Angeles to Santa Monica in 45 minutes. However, even before Los Angeles County Metropolitan Transportation Authority’s new set of trains began operating 26 years ago, the Pacific Electric company operated a vast network of streetcars that started in downtown and led to the edges of Los Angeles County. In fact, today’s Expo Line is built on a similar route called the Santa Monica Air Line. Many streetcars similar to the Santa Monica Air Line operated throughout Los Angeles County until 1953. 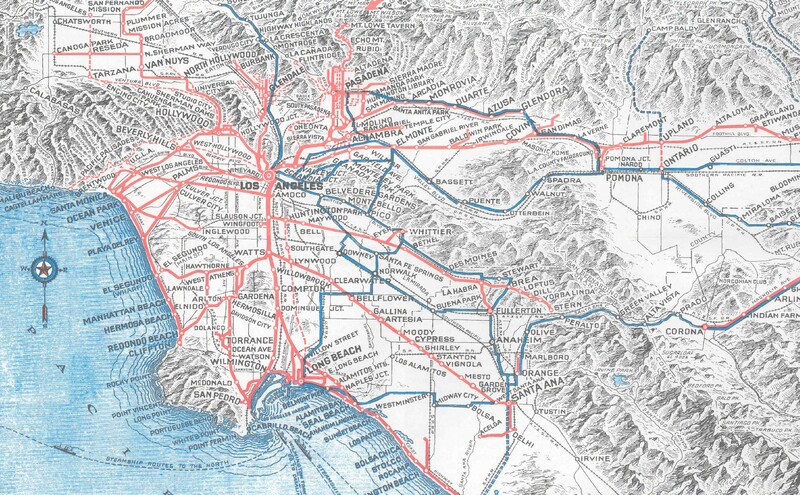 Pacific Electric created its first railway system in 1901, which started off with 452 miles of rail, compared to the about 100 mile-system Metro has today. In a November 1901 issue of the Los Angeles Herald Examiner, founder Henry Huntington said he imagined expanding his company all throughout Southern California, in hopes of promoting business growth and development. The Expo Line is really a second incarnation of Pacific Electric’s Santa Monica Air Line. It began in downtown, ran down by the University of Southern California, entered Culver City, passed by Palms and then Santa Monica. From there, it went to Inglewood. Whereas now there is only one train operating in West Los Angeles, there used to be a handful of streetcar lines until the 1950s, many of which passed near UCLA. The company’s Venice Short Line began in downtown on Hill Street, then ran down 16th Street, now Venice Boulevard, until Western Boulevard, then ran through Culver City, Palms, Venice and ended in downtown Santa Monica. This line was also similar to the current Expo Line. Lines like these connected the whole city. The Santa Monica via Sawtelle Line also started in downtown, but in the famous Main and 6th streets terminal, and made a nonstop route to Beverly Hills, where it turned onto Santa Monica Boulevard and ran until it reached the beach. What was also important was how Pacific Electric and other companies to create a comprehensive public transport network to UCLA. The Sept. 25, 1929 issue of the Daily Bruin, the first issue after UCLA moved to Westwood, mentioned all the new bus lines connected to train terminals. One bus ran from Hollywood Boulevard to Western Avenue and another one from Pico Boulevard. The Wilshire Boulevard line, now the Metro Rapid 720 bus line, also began operating in 1929. Transportation was especially important to students since then, since UCLA was considered a commuter school. This was evident when students and even The Bruin’s editorial board spoke against fare increases the Pacific Electric company proposed. A 1951 editorial said if the company raised its fares, commuter students would be paying about $34 a quarter to get to UCLA, more than student fees were at the time – $25. The fare still passed, but it proves just how valuable and convenient the transportation provided by Pacific Electric was to students. Even today, 60 percent of UCLA’s 60,000 commuters use sustainable modes of transit, like public transportation, bicycles or carpools. After the demise of the streetcar in the 1950s and 1960s due to increased cars and suburbanization, Los Angeles is slowing trying to make an effort to turn to these modes of transit instead of the car. This is evident in Metro’s proposed 40-year plan to build a handful of new trains throughout the area, and the city-council-approved Mobility Plan 2035 that aims to create multi-modal transportation options safe and efficient. The plan would add hundreds of bike lanes, bus lanes and pedestrian improvements throughout the city within the next 20 years. But within a short time frame of 10 years, we will see the Crenshaw/LAX line open, the Regional Connector join the Blue and Expo lines with the Gold Line in downtown and probably see the Purple Line reach Westwood. The city’s current public transportation system, although not at early 20th-century streetcar status, has a lot of potential to change how we get around. In short, the Expo Line extension is a development that references Los Angeles’ history as a streetcar city while moving the city into a new age of transportation.